Barring any unforeseen blast of cold from a pop up thunderstorm that just happens to rain itself over Philadelphia for several hours on end, today marks a record tying streak for Philadelphia where the temperature has been at or over 70 degrees. The last time we saw such a streak was back in 1995 -- July 12th to August 6th. 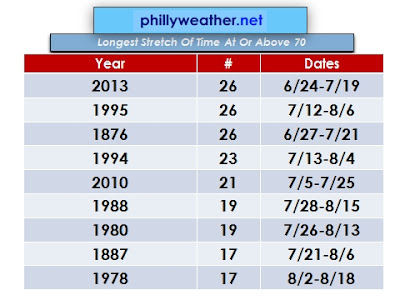 Assuming we continue through tomorrow with temperatures above 70 (which, I think, seems likely at this point), we will break a record for the longest streak of 70+ temperatures here in the city. While the stretch of humidity has arguably been among the most oppressive on record this summer and has been a factor in this summer's warm ways and our stretch of consecutive days of 70 or warmer, the heat wave this summer pales in comparison to some of the longer heat waves of the past. We'll likely end up with a seven day heat wave (90+) before this ends after Saturday, which is five days shorter than the longest streak last summer (12 days) and ten days shorter than the record stretch of 90 degree highs (17 days) in 1995. More: Background on the 1995 and 1876 streaks. Some of the modeling out there suggests the possibility that we continue the 70+ streak beyond Saturday and into a chunk of next week. It will be a close call as modeling for the Airport is suggesting 70ish lows on four nights next week. I venture to think one of those four probably slips below 70, bringing the streak to its ultimate demise...but not before we set a record for most days sweating above 70.